This bread is so good! Serve small slices on the side of an Italian meal instead of garlic bread… or serve large slices with a side salad as a meal by itself. 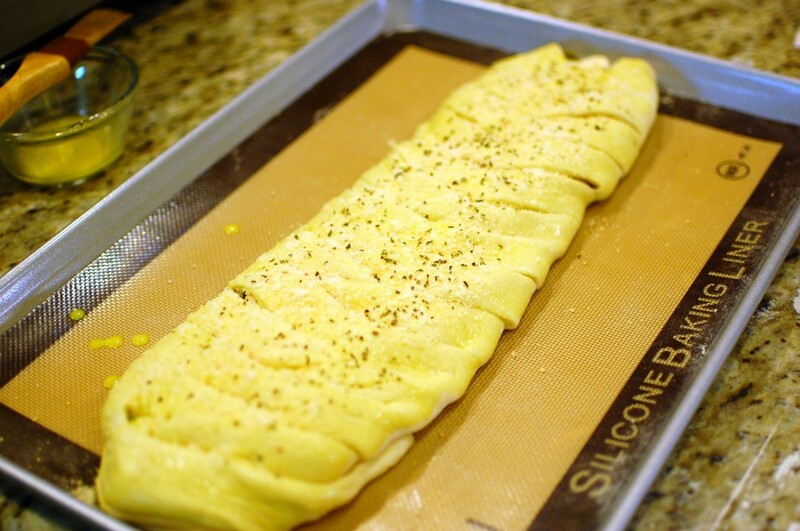 If you don’t want to make the bread dough from scratch, feel free to substitute with store-bought pizza dough. 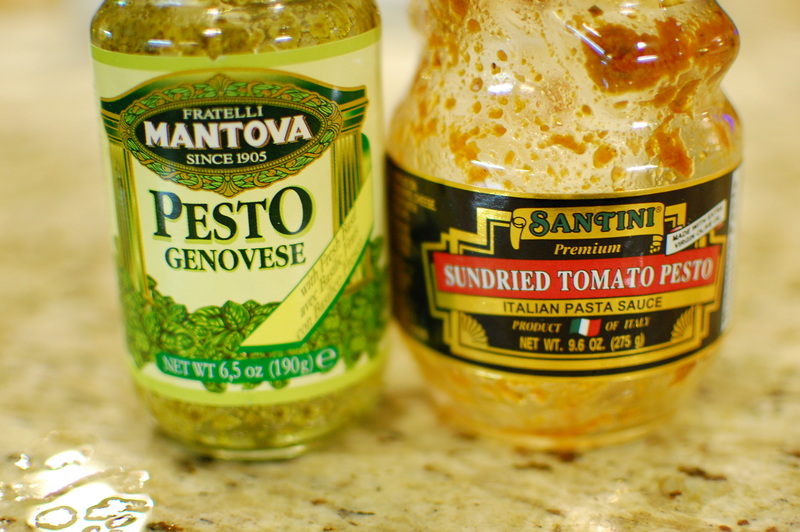 You can also use all pesto, or tomato sauce – basically whatever sauce you want. A little bit of sauce, a little bit of cheese… you could even stuff it with pepperoni or mushrooms. Be creative! 1. 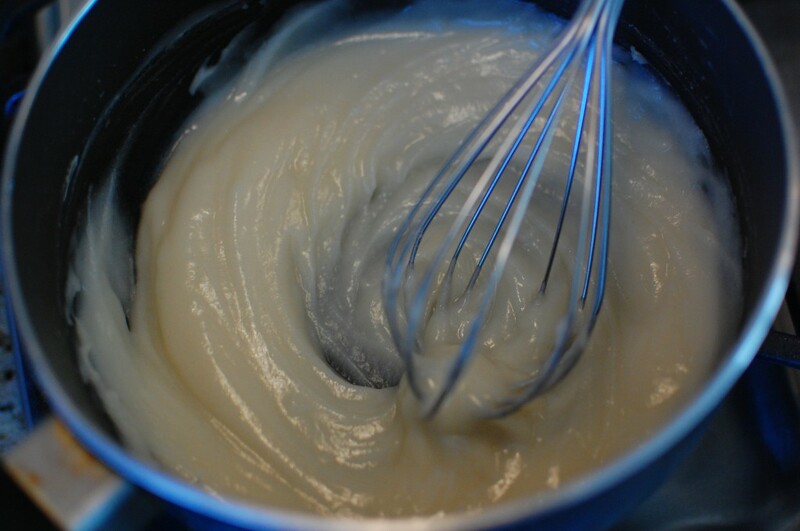 Make the Tangzhong: Whisk the flour + water in a small saucepan, and heat over medium while whisking. 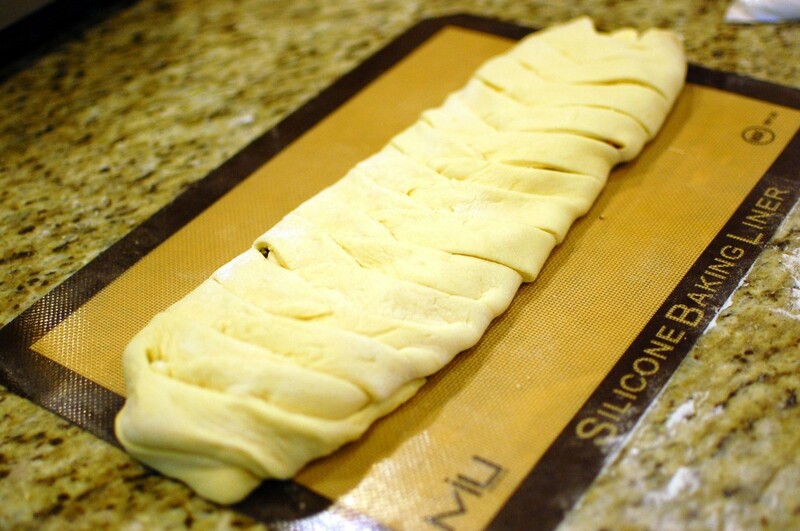 When the mixture thickens and swirl lines appear, remove from heat and allow to cool. 2. Make the Bread Dough: Add the tangzhong, butter, sugar, salt, and egg beaten with milk to the bottom of the bread machine pan. Add the flour, and make a well – place the yeast in the well. Turn the machine on to the “bread dough” setting. 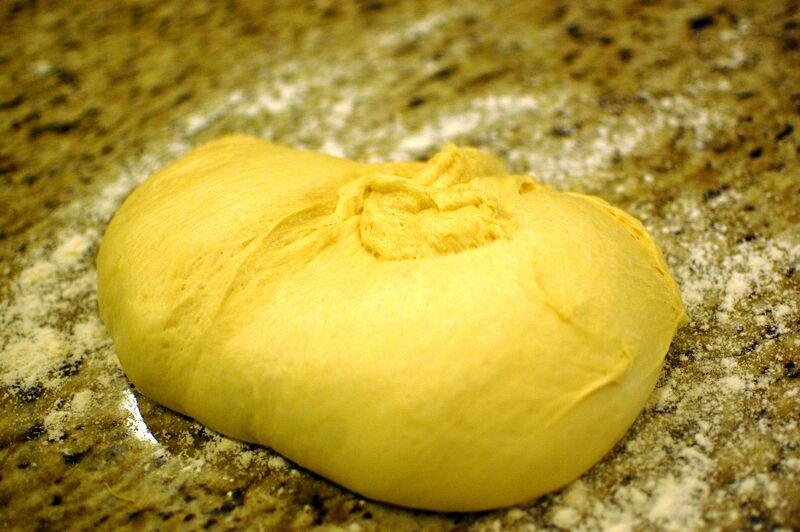 Alternately, you can knead the dough by hand and allow to rise, then punch down, and allow to rise again. 3. 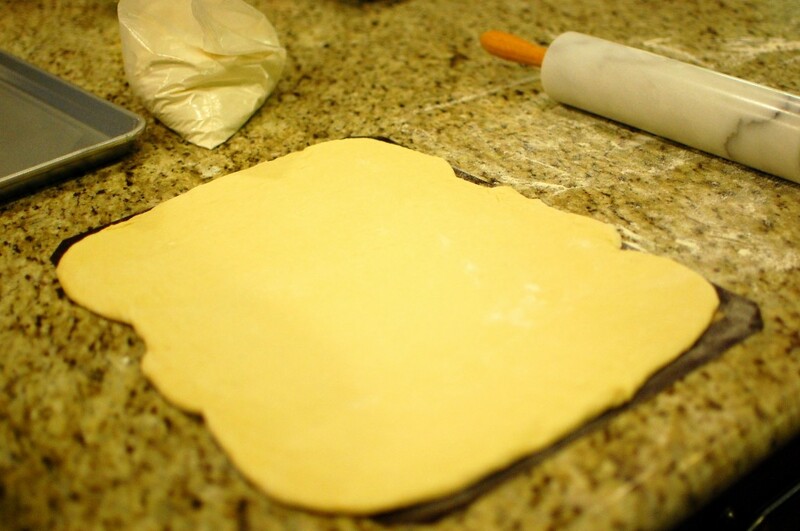 Roll the dough out on silicone baking mat into a large rectangle. 4. 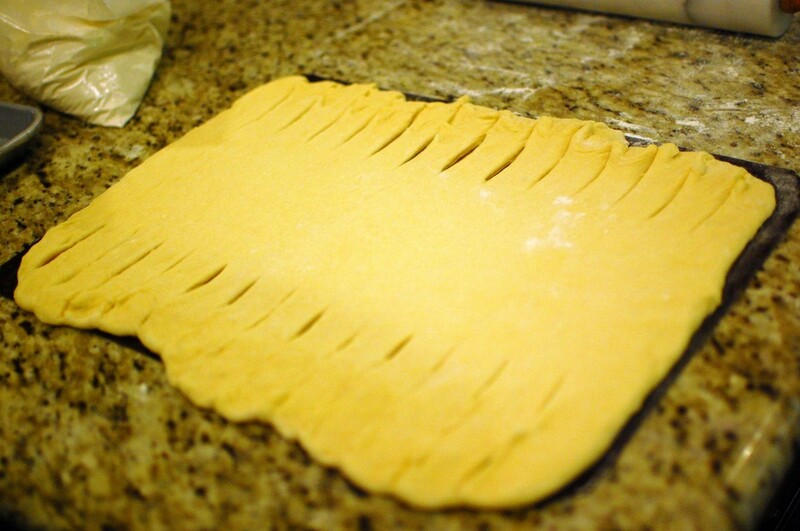 Use a sharp knife to cut “strips” on the right and left side of the rectangle. Leave the middle third uncut. 5. 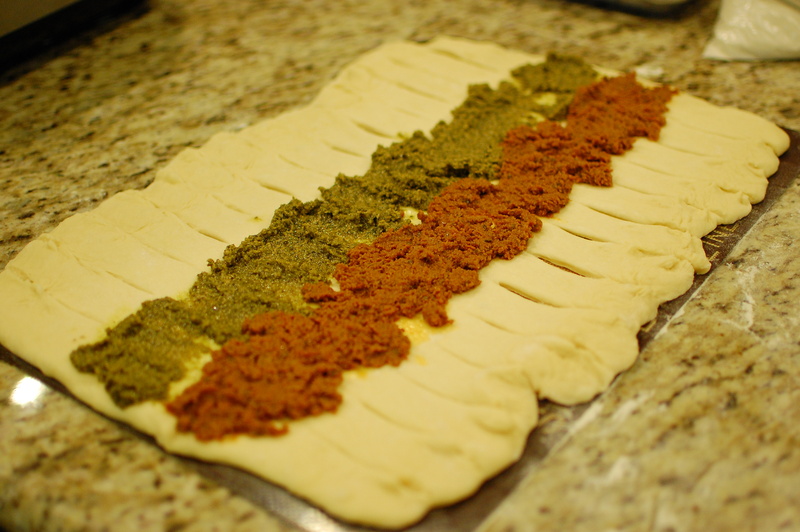 Spread the pesto down the length of the middle (uncut area of bread dough). 6. Top the pesto with small slices of the mozzarella, then sprinkle with the parmesan cheese. Sprinkle with about 1/2 tsp. of dried basil. 7. 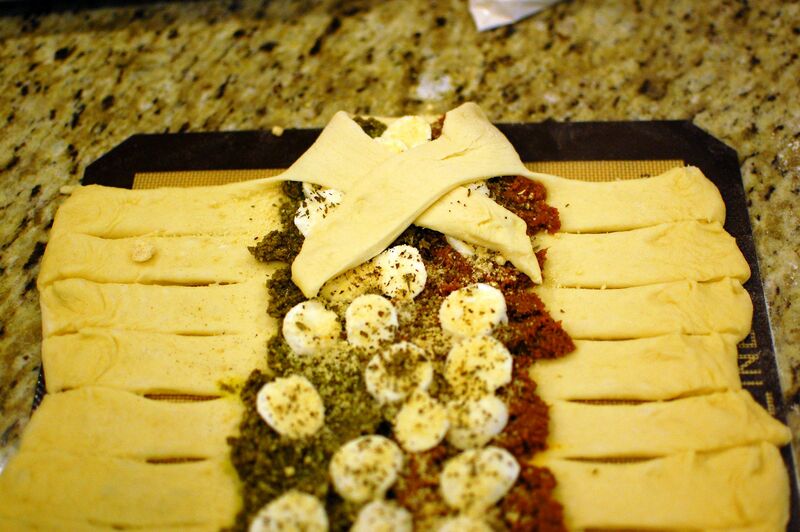 Take the top two strips of dough, and overlap them over the cheese mixture. 8. Continue to “braid” the dough strips all the way down to the bottom. 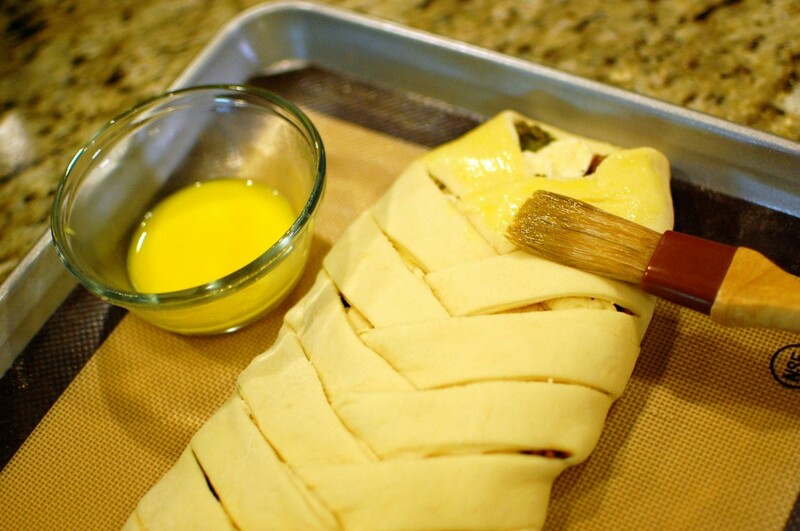 Wrap the last few strips underneath the loaf. 9. Brush the top of the dough with the egg wash.
10. Sprinkle the remaining basil, and a little bit of parmesan cheese over the top. Bake at 335 degrees for 20 minutes. 11. 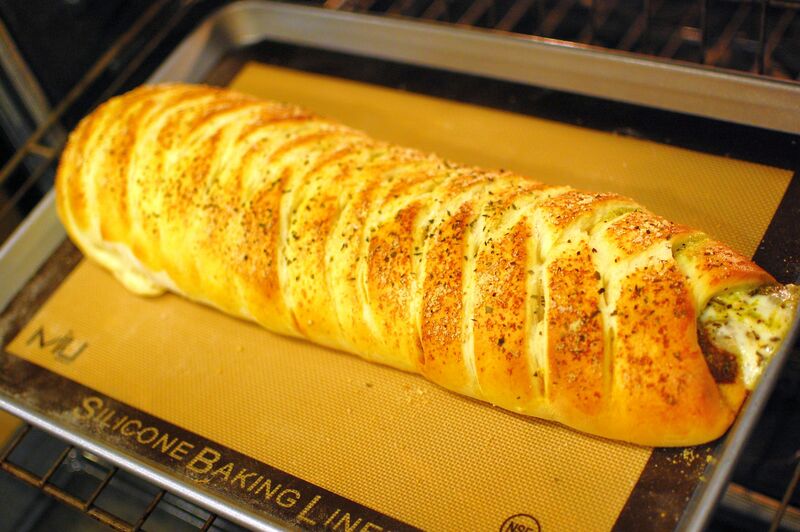 Remove from the oven and cool for 10-15 minutes before slicing. Can you use all purpose flour if you dont have bread flour? Yes, you can use all purpose flour… but you will get a slightly better result with bread flour. 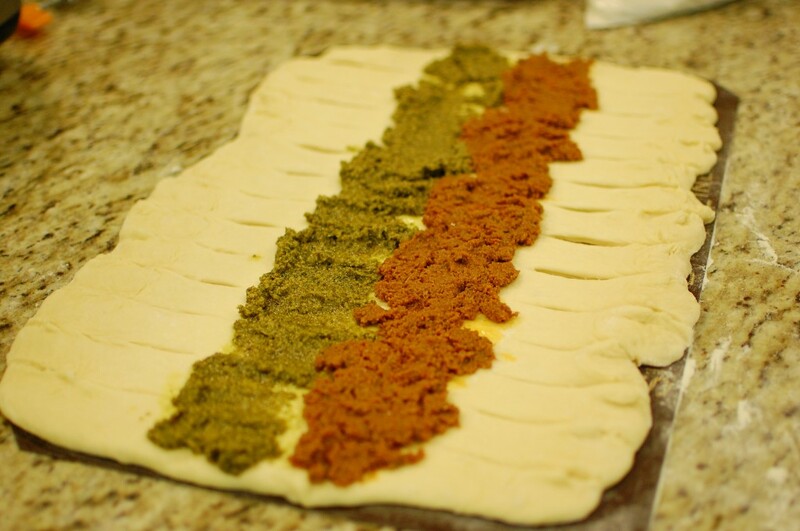 How long do you let the dough rise and then rise again? Hi there! If you are making the dough by hand, and not using the bread machine, I would probably allow the dough to rise for about 1 hour in a warm place after kneading (you want the dough to double during the first rise, so about 1 hour give or take). Then punch down, and allow to rise another 30 minutes or so. The dough might rise faster or slower depending on the temperature where you are… so I would use those times as a loose guideline and go from there. 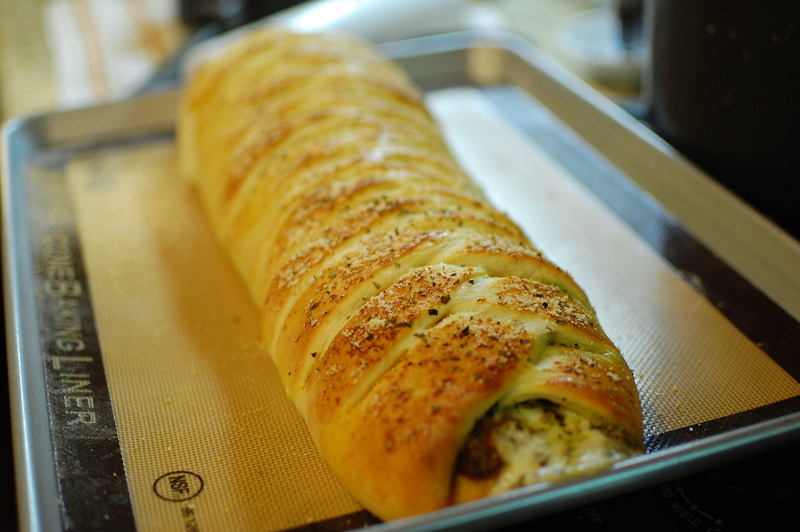 Made this bread twice in one week.. loved it!!!! I used half all purpose flour and half whole wheat bread machine flour..
Great! I’m so glad it worked out for you! Can you prepare it ahead of time and bake it later? Yes, you can make this the night before and bake it the next day if you like. Just make sure you bring it up to room temperature (loosely covered in plastic wrap) first before baking. Hiya! how long does this take in total? (Including prep, cooking time and proving). Thank you! I made this yesterday using all purpose flour. However the dough was extremely loose and unmanageable..had to add another 3/4 to 1 cup flour. The resultant dough was still loose but I managed to handle that. Not sure what part needs to be fixed. The bread was super soft though. This is a very soft dough that requires a light touch – that’s what gives it the fluffy cloud texture once baked. Make sure that you are only adding 1/2 c. tang zhong to your dough recipe.